Small and unobtrusive, our Mini Round Fridge Thermometer features both a numbered and colour coded temperature scale for easy reading. 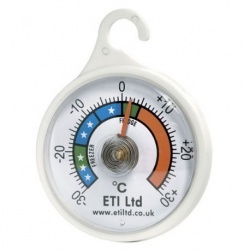 The coloured temperature zones also allow you to quickly see if a safe storage temperature is exceeded. To use, simply hang from a shelf with the fridge that you want to monitor. Product fine. Delivery terrible. Ordered and paid for next day delivery and eventually arrived 3 days later. Won't be using again. Sorry was sent Parcel Force who did try to deliver next day at 18.30 and then 2 days later. Very sorry for Parcel Force delay. But then the review is about the product not service ? Excellent service. Good value, cheap and cheerful. Really quick delivery. Accurate description of item that was delivered. Very impressed. Bought two and found them to be reading the same values for all applications i.e. 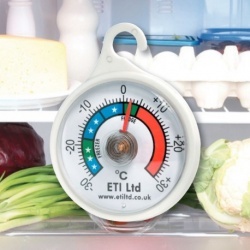 ambient, freezer or larder fridge temperatures, therefore satisfied that they provide a good overview of the state of appliance temperatures. We have found the product very useful, and the cost very good as we could give some away to friends with boat fridges.